West Virginia has a high number of citizens who answered the call during times of conflict. 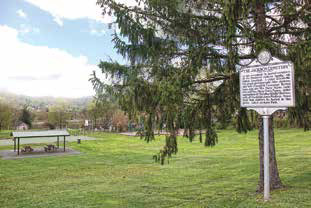 Around the area of Greater Clarksburg, there are a number of historic markers and cemeteries where our heroes are interned or their stories told. For historians and civil war buffs, these are must-see sites. On the Courthouse Plaza, dedicated in 1963, this monument stands as a memorial to all those who gave their lives and in honor of all who served on the battleship USS West Virginia which sank on December 7th, 1941. 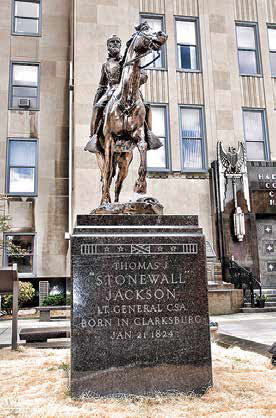 Clarksburg’s most famous son is honored with a life-size bronze statue depicting him racing into battle atop his horse. This statue is a focal point located on the courthouse plaza at Main Street and 2nd Street. Depicting the diverse make-up of the population in and around Clarksburg, a statue has been erected on the courthouse plaza. This cemetery is the resting place of many U.S. Soldiers including veterans of WWI, WWII, the Spanish American War, and Vietnam. You will find this cemetery at 279 Marshall Street in Clarksburg. Opened in 1865, this cemetery contains the graves of many prominent families of Clarksburg and was used as a campground for soldiers during the Civil War. This cemetery is on South Chestnut Street at Washington Avenue. Established in 1801, this cemetery holds the graves of Stonewall Jackson’s father, sister and great-grandparents as well as Dolly Payne Madison’s sister and mother. The Jackson graves are well-marked and are located in the rear of the cemetery. This cemetery is located on South Linden Avenue or accessed from E. Pike Street. This cemetery is the resting place of many Civil War soldiers. Current records only indicate Union Soldier burials. Located approximately 10 miles from the Clarksburg courthouse in Salem, WV, take Route 50 west to the Marshville exit and drive 1.6 miles to see it on the left. This cemetery contains the graves of Major William. Haymond Sr., a sergeant under Col. George Washington during the French and Indian Wars and as an officer in the Revolutionary war; Sotha Hickman of the Virginia Militia in the Revolutionary War and Major Thomas Haymond, an Indian Scout. Both of the Haymonds were surveyors of Harrison County. This cemetery is located south of Clarksburg off Route 20 on Zack’s Run Road. Located at the intersection of Hwy 50 and W.Va 73 is the oldest cemetery in Harrison County with graves dating back to 1782. This monument, located in front of the Clarksburg City Building at 222 W. Main Street, was dedicated on May 30th, 1908 and was erected by the citizens of Harrison County in memory of its soldiers who served in wars from 1776 to 1907. 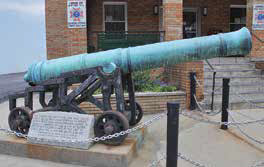 To commemorate the Spanish-American war of 1898, a Spanish cannon sits in front of the Post 573 Veterans of Foreign Wars building at 430 W. Pike Street. This cannon was captured in May 1898 by U.S. Naval Forces under the command of Admiral George Dewey near Manila in the Philippine Islands. The cannon was cast in Seville, Spain in 1795 and weighs 6,283 lbs. Between 1933 and 1944, the Civilian Conservation Corps had over 4,000 CCC camps nationally with 67 camps in the state of West Virginia. The lasting achievements of this organization can still be seen today as all generations will continue to benefit from its work. In our Mountain State, some 55,000 young men fought more than 10,000 forest fires, built hundreds of bridges, planted millions of trees, developed more than 30 state and national parks and parkways and MUCH more. To commemorate their efforts and achievements, The West Virginia CCC Camp Museum was created with over 250 memorabilia items from the 1930’s and 1940’s, each one with a story. The museum is located near exit 115 off I-79 in Harrison County at Quiet Dell.